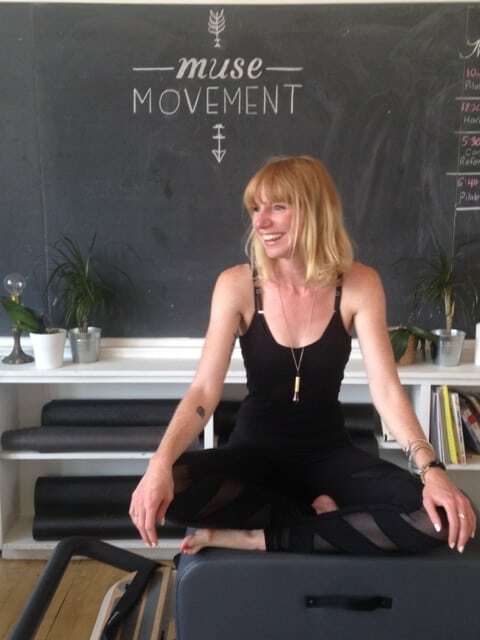 Keri O’Meara is the brains and brawn behind MuseMovement a gallery and Pilates/yoga studio located in the Artscape Youngplace building. (Fun fact: She also used to write for SDTC!) After suffering for years from Rheumatoid arthritis, Keri spent much of her early twenties feeling a lack of direction. She eventually discovered a passion and focus for Pilates and yoga. This passion quickly blossomed and became the basis for her career in teaching. We talked to Keri about what a typical day looks like for her (spoiler alert: it sounds BUSY!) and indulges us with her very own “fantasy day-off” itinerary. She also shares some of her wisdom from running a business. What does a typical day look like for you, from waking up to going to bed? KO: I usually wake up around 6:30. I put on coffee before I even pee. Sometimes I don’t even get to the coffee for like half an hour or make it even when I won’t have time to drink it, but it’s my morning ritual and has been for so many years. I probably should relieve myself first though. I meditate for ten minutes (before the coffee) and then usually have enough time to get back into bed with my journal and java and I try to write for at least twenty minutes. Some days it ends up being just a long to-do list, but what I aim for is some reflection. In addition to my to-do list, I have a to-be list. I think about who I want to be in the world that day and I write it down so I can commit to it. Really the to-do’s don’t matter if I’m not being what or who I want to be. After that I try to do an Instagram or FB post for the studio. Then I get ready for the day. In the summer I tend to put more effort into my appearance; there are just so many more options and I am out about town more. In the winter I often just leave the house in my Lulus. I get pretty lazy in the winter. Then, I teach. Between private clients and group classes I typically teach about 5-6 hours a day. I take Sundays off. As much as I love my job and my business, I won’t even go near the Studio on a Sunday. Of course, that’s not always the case. The thing about running a business is you never really have a day off. It is important to try to take some time to regroup and recharge. In between teaching I take meetings, answer emails, try to blog or make YouTube videos for Muse, do admin or accounting, schedule clients etc. When I first opened, I tried to do EVERYTHING everyday. I discovered fast, that doesn’t work. Now, I set a day for certain things. Mondays I work on marketing, Tuesdays I take meetings, Wednesdays I look at the books, Thursdays I spend some time reflecting on the business, honing my vision and setting goals. Every week looks a little different and you gotta roll with the punches. Somewhere in there I have lunch. I pick up lunch from The Goods on Dundas on my way to work. I love their salads -so delicious and healthy and they keep me fuelled for long days. Some days I squeeze in a yoga or Pilates class. It keeps my teaching fresh and inspired when I take other people’s classes, and if I can’t, I’ll do some self-practice. I am at the studio till 8:00, after which I’ll meet friends for dinner and a glass of wine or two. I try to get to bed by 11, though – not gonna lie – sometimes I pass out by 9:30. You have a day off to do whatever your heart desires! Where do you eat? Shop? Stroll? The evening would be spent with my besties: cocktails at Bar Raval, dinner at the Harbord Room and then a show at the Molson Ampitheatre. Lots of dancing. If it’s my fantasy, it would be Patrick Watson or Arcade Fire or the Alabama Shakes or all three. A girl can dream. A night cap at Cold Tea Bar in Kensington Market to complete the day – I get to sleep in the next day right? Congrats on the success of MuseMovement! How/when did the idea come about? It is a real honour to be featured in Her Career. When I was a writer for SDTC many moons ago, this was always the most baffling and exciting section for me. I had no idea what I wanted to do other than having a career. I wanted to wake up every day and be excited to work. I was so curious and full of admiration for these strong women that had these awesome careers. And then I found the thing I was meant to do. It was a surprise to me that teaching movement was what it was. It has also been a surprise to me that I love being an entrepreneur as well. The passion seed was planted, and that’s where ideas, ambition and motivation grow from. Since I started teaching six years ago, it’s been my dream/plan to have my own studio. Last year I left the studio I had been teaching at and managing for almost three years, really burnt out and unsure of what my next steps were. I was armed with many lessons and I needed time to process them, reassess, and be really clear about what my values were as a teacher and as a person. I have the most loyal and lovely clients whom I continued to see out of my home and I also taught a few group classes around the city, but I made sure to keep my schedule light. In that space I became really focused and realized I was ready to take the plunge. I spent months writing a business plan, looking at spaces and wondering whether I was crazy and then I found the space at Artscape and fell in love. It was actually the first place I looked at and because of that I originally walked away from it. I didn’t want to be rash. Three months, and many disappointing viewings later, the realtor for the space called me and said it was still available. The next day I was in his office signing papers. When the universe tells you something, you gotta listen. I don’t want to make it sound like I didn’t put any work into creating this space, community and vision because there was a lot that happened on the back end, but once I had a studio it all just felt very organic the way it came together. I was a server for ten years, so friendly and informed customer service was always a must for me. When I combined that with my passion for teaching and my almost-OCD insistence on being organized, everything just started to flow. 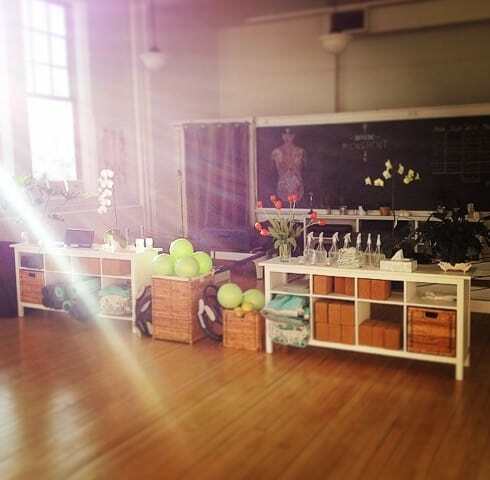 Once the space was open I was ready to just show up and teach my heart out. For sure there are days when that is hard, I am tired and being pulled in so many different directions, but ultimately I am just so grateful and that makes it all worthwhile. That’s a tough question because the truth is I never feel successful enough by my own standards, I always want to be doing better. When I was a teenager I used to carry around this quote in my journal about success being about the simple things – planting a garden and seeing something grow; making a child laugh; being there for a friend and ultimately making someone’s life a little bit easier, even if just for a moment. My point would be so much more effective if I had the quote or remembered who wrote it…but I always come back to it. If a class I taught made someone’s day a little bit better, or even helped relieve pain from an injury, if coming to MuseMovement helps someone connect to their body then I’m doing my job right. I received an email from a client the other day telling me how MuseMovement is her happy place. That is success. Any advice for women looking to open their own businesses? Set goals but be ok with making mistakes. My first Pilates mentor said to me, “If you know what the end goal is, who cares what road you take to get there?” I think that’s a really good nugget. On that note – have mentors. Seek advice where you can get it. Make life easier for yourself – be organized. Get a good accountant (Shannon Simmons – New Wave of Finance is a rock star). Take time for yourself. Know when you are about to burn out and go to the spa. Don’t be afraid to delegate but make sure it’s done your way – it’s your business so that’s your right. Margot McKinnon, creator and owner of Body Harmonics, graciously offered me some of her time when I first opened the business. Oh my god, she must have thought I was a disorganized mess, but she was so lovely. Her biggest piece of advice was be clear about your vision. Take the time every week to ruminate on everything, from how you want the phone to be answered to what the bigger goals are. She said every decision will be easier that way and things will just start to fall into place. She was right. So I reiterate – get a mentor. What do you love most about working in the fitness/wellness industry? The collective project of working on and learning about your body. I am in the business of providing a service that hopefully makes people strong and happy. What’s not to love? Also, I meet some pretty awesome people. I get to hear people’s stories and see them turn into butterflies through movement. What aspect of the business do you find the most challenging? I am a do-er. I want it all done now, so having patience and trusting in the process is a hard one for me. The other challenge is decision making. I have a huge support network of friends and family and the best staff/teachers, from whom I seek advice, but at the end of the day all decisions land on me. That can be exhausting. It is teaching me a lot about my relying on my instincts and being okay with making mistakes. If you could try a different career for a bit, what would it be? I can’t possibly think of something I’d rather be doing. But, if I had to change it up for a year, I’d move to a small seaside town in Portugal and attempt to write a novel. What’s something we should all be doing to ground and centre ourselves? Anything to connect your brain and your body. It doesn’t have to be big – we don’t always have time to take a class so just take a minute to close your eyes and scan your body; take a few deep breaths, stretch, move, dance, laugh out loud and love. 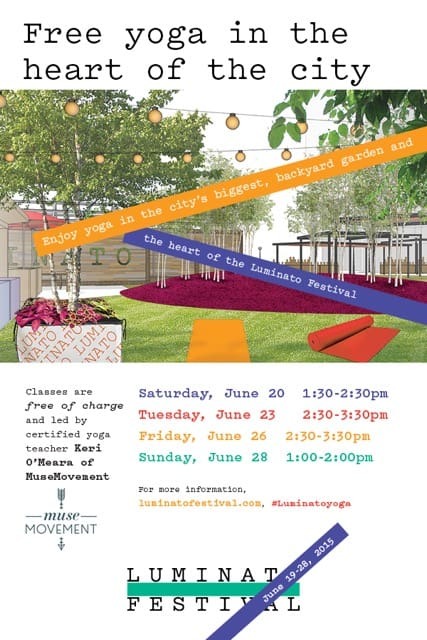 Keri is teaching free yoga classes this month on June 20, 23, 26 and 28. Find out how you can sign up at luminatofestival.com. Keri is also offering 10% off all online purchases at MuseMovement for the month of June! The promo code is SMITC (She Moves In The City).